Fill the Cookie Jar is a blogging event hosted by Cynthia of Feeding Big. June’s theme was “summer”. With the first holiday weekend that typically kicks off the start of summer just behind us, I decided to go that route with my cookies. These cookies come together so quickly. You don’t need to worry about softening butter or a ton of ingredients. Instead these are made using cake batter which results in a light as air fluffy cookie. These patriotic cookies are easy to make using cake mix and food coloring. 1. In the bowl of a stand mixer, add the powdered cake mix, eggs, applesauce and vegetable oil. Mix on medium speed until combined. 2. Divide batter evenly into three bowls. Add red food coloring to one bowl and mix until you reach the desired color you want. 3. Add blue food coloring to another bowl and mix until you reach the desired color you want. Refrigerate each bowl for 30 minutes. 4. Preheat the oven to 350 degrees and line two baking sheets with parchment paper. 5. Drop tablespoon sized dollops of batter into the powdered sugar and roll to coat. Place on the prepared baking sheet, 1 inch apart. Repeat with each color. 6. Bake for 9 minutes or until centers are set. Allow to cool on baking sheet for a few minutes before transferring to a wire rack to cool completely. You could use all applesauce or all vegetable oil in this recipe if that’s what you have on hand. 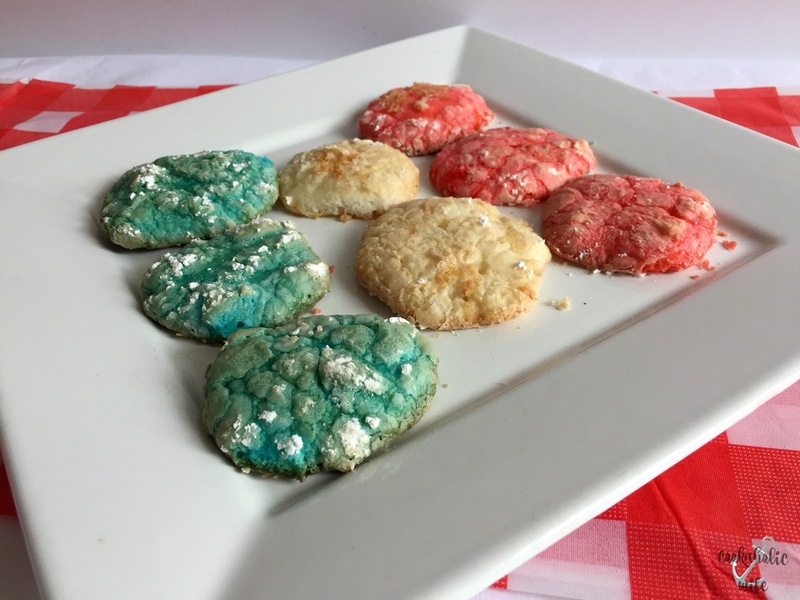 These cookies are so light and fluffy they are very similar to the texture of angel food cake. Make sure you take some time to see what the other home bakers have been creating! How fun! So many fun combinations. 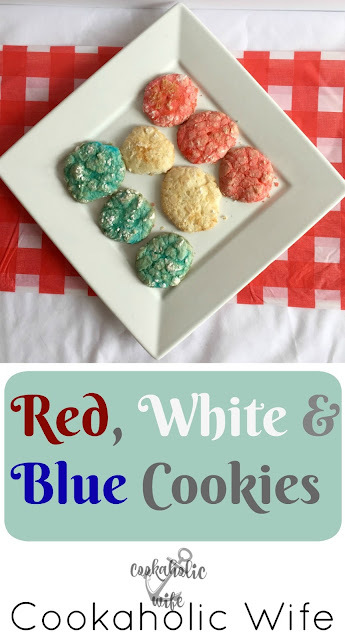 These are so much fun for those patriotic holidays. And I love that they are easy, because who wants to be inside baking during summer. 3 in 1 works for me! I love these cookies. I think it is fun to make a cookie based on a theme. You are a busy woman. I have always wanted to go on a cruise! Enjoy the new house. Thanks for being a part of the Fill The Cookie Jar group! Cake mix cookies are such a great thing, Nichole, especially when life is so busy. 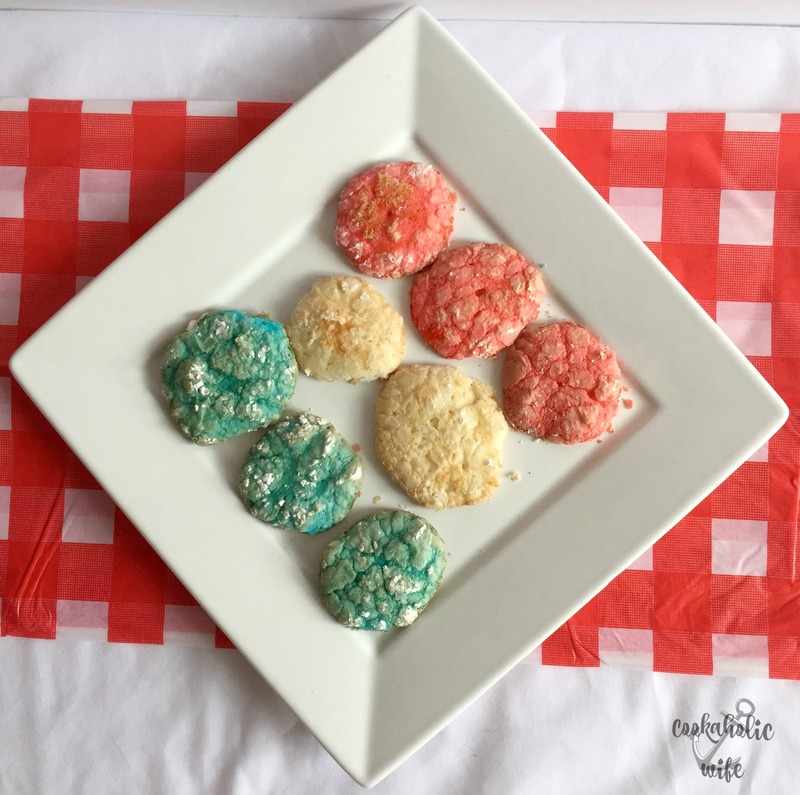 What fun and festive cookies. I love easy and quick recipes (that no one else can tell are easy!). I think I'll whip up a batch this weekend with my children.